Modeling Future Heroes works with Rotary International on many of their club-sponsored projects. Principal Daniels at Nederburg Elementary School is a true inspiration for us all! Read his amazing and heartwarming story below! 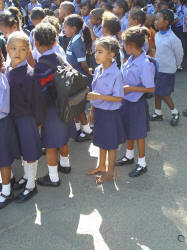 Children attending school must wear uniforms. Sometimes parents can buy a uniform or shoes, but not both. During the assembly, Mr. Daniels asked the children to pray for all the children who died in their town during the week. 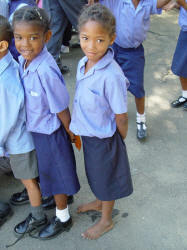 In 1997, there were eight hundred and fifty students, grades 1-7 at Nederburg Primary School in Paarl, South Africa. Their new principal, Mr. Daniels, had a formidable task ahead of him. The first thing Principal Daniels taught the children was to hide on the floor when gang fights broke out. The second thing Principal Daniels did was to repair over eight hundred school windows resulting from the six rival gangs fighting against each other over turf to sell their drugs. Today, however, it is more peaceful in the community. How could this be? Gang members around Nederburg engaged in gunfights and territorial wars for years in and around the Nederburg School. They did this because unemployment in community is often close to 70%, meaning there are no jobs. Mr. Daniels called a community meeting in 2000 to start a community garden on the school property . It did not materialize and in 2001 an ex- gang leader, Danny Arendse, came on board to start the garden . Planting vegetables and selling them at a roadside stand let members of the different gangs work together to bring peace amongst themselves and hopefully eliminate the violence. Several gang members, some having fought each other for years, put down their weapons and worked together in harmony. The local Elsenburg Agricultural College supplied hundreds of feet of piping and several aboveground sprinklers and advised them what to plant and when. Nederburg School paid initially the water bill but in 2004 they could not afford it anymore and asked Danny and his team to pay it. Left: Group shot of some gang members. Right: A flower garden the gang members grew as "thanks" to Principal Daniels. The Peace Garden came to be in 2001. The school saw a dramatic drop in the gang territorial wars and the vandalism and break-ins to the school almost totally ceased. The gang members were supporting themselves and their families from vegetable sales. 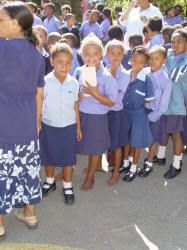 The vegetables not sold were donated to the feeding scheme of the school local and to the area's poor. It was rewarding to see the ex-gang members make the turn from outlaws to humanitarians, from a drain on society to a benefit and true asset of the Nederburg community. The Peace Garden was nominated as one of twelve finalists in the Crime Issie (English: is not ) Cool Project organized by the biggest newspaper in the Western – Cape Province and the Ministry of Security. The Peace Garden was visited by the Indian Minister of Agriculture, Mr. Ajitt Singh. The garden was showcased on World Poverty Day on the national television as well in the provincial and local newspapers. Turning gangsters into productive citizens - what a story! Principal Daniels and the ex-gangsters received national publicity as an inspiring beacon for community involvement and crime reduction through citizen efforts! I met with Principal Daniels and saw the Peace Garden in June of 2008. I am sorry to say, the Peace Garden is gone. Why?Danny and his team could not pay the monthly water bill and the water supply was cut off in July 2007. 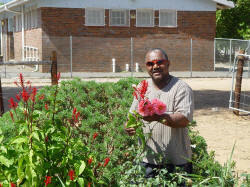 Drakenstein Municipality presented the garden-gang leader, Danny, with a water bill for over 30,000 Ran (about $4,000). Also last year, Nederburg Primary finished installing a Sports Field for the children financed from donations and grant money, but is struggling as it needs water to sustain it. Drilling a water well or borehole at Nederburg Primary,will provide water for both the Peace Garden and the sports field. The cost of this project is estimated to be around $13,000-14,000. This includes paying the Drakenstein Municipality for the Peace Garden’s water bill. By having it’s own water supply at the school, The Peace Garden will be restored, and the sports field will reach it’s potential to provide the now seven hundred and ten students at Nederburg School with their first ever sports facility. This will also be used by eight other sport groups who will help maintain it. A school with a sports field also is a safe haven for families to come and support their children away from the threat of gangs. What a romantic Rotary Club project this would make! 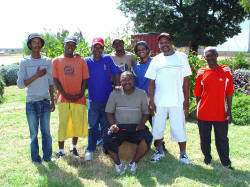 Restore the Peace Garden to Nederburg Primary School and give life to the sports field that took (8) years to install. – wow! Go to the Gangster Page to finish this wonderful story! WHAT CAN YOU DO TO HELP? CLICK HERE! Email Roger Cram for more information.